Then the temple of God was opened in heaven, and the ark of His covenant was seen in His temple. And there were lightnings, noises, thunderings, an earthquake, and great hail. Now a great sign appeared in heaven: a woman clothed with the sun, with the moon under her feet, and on her head a garland of twelve stars. What is the purpose of all the mysteries of Christ? To be the pattern of our supernatural life, the means of our sanctification, the source of all our holiness. To create an eternal and glorious society of brethren who will be like unto Him. For this reason Christ, the new Adam, has associated with Himself Mary, as the new Eve. But she is, much more than Eve, "the Mother of all the living," the Mother of those who live in the grace of her Son. 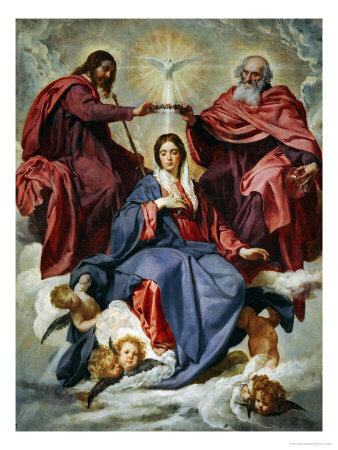 And since here below Mary was associated so intimately with all the mysteries of our salvation, at her Assumption into heaven Jesus crowned her not only with glory but also with power; He has placed His Mother on His right hand and has given her the power, in virtue of her unique title of Mother of God, to distribute the treasures of eternal life. Let us then, full of confidence, pray with the Church: "Show yourself a Mother: Mother of Jesus, by your complete faith in Him, our Mother, by your mercy towards us; ask Christ, Who was born of you, to give us life; and Who willed to be your Son, to receive our prayers through you."